Mortgage interest rates have shifted from nearly 19% in 1981 to 3.31% in 2012 for 30-year fixed-rate home loans. 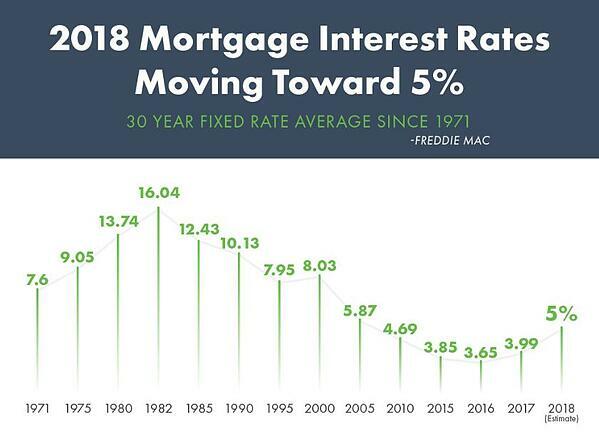 We’ve all seen the rates slowly rise over the past year or so, but that shouldn’t keep you from buying a new home or refinancing out of a balloon or adjustable rate mortgage. You’re still in a great position since rates are nowhere near that 19% rate, and fortunately don’t look to be trending that drastically. While higher interest rates typically mean a stronger economy, they also bring potentially higher costs to home buyers. But the fact of the matter is that mortgage rates today remain at historical lows and home buyers continue to reap the rewards. That’s great news! Rates are trending higher because the U.S. government is expected to take on more longer-term debt, and global banks are stepping back from previously adopted policies. So, what does that really mean, and why is it important to you? This means the U.S. economy is very strong right now and there’s a continued upward drift of inflation. The underlying data is showing that interest rates will more than likely continue to rise and that the stock market is doing really well so we can tolerate higher rates. Obviously there’s a tipping point, but for now things are looking good. Rates for both the 30-year and 15-year fixed-rate mortgages have remained historically low. Rates for 30-year loans are typically higher than those of a 15-year; this is because there’s a lower monthly payment for the 30-year since it takes a longer time to pay back. The 15-year has the obvious advantage of being half the time of the 30-year mortgage, so you’re likely to pay off your mortgage and own your home free and clear faster. A 15-year mortgage can save you money, while a 30-year may be better for your current budget (and you can always make additional payments when you’re able). With a 15-year mortgage, you’re likely to build equity in your home quicker. Think about your long-term and short-term financial goals—each of these loans could help you achieve something different. When in doubt, an experienced Home Loan Specialist can help! You can look at your financial goals together and make a homeownership strategy plan that’s specific to you and your current situation. You can always reevaluate later on if anything in your life changes. Trying to predict which way rates will go is difficult so it’s probably best to not take these historically low rates for granted. You’ll be able to get a great rate in today’s market which will ultimately save you money on interest in the long run. A fixed-rate mortgage is always less risky than an adjustable rate or balloon mortgage. Refinance now from an adjustable rate loan, to reduce your monthly payment; or remove private mortgage insurance (PMI). Reach out if you have any questions about interest rates, changing your loan terms, or just need more information about the mortgage process in general. We’re happy to help set you up for success!